How much paper do you use on a weekly basis? A daily basis? In my classroom, I use none. Zero. Zilch. How do I do it? I use One Note. 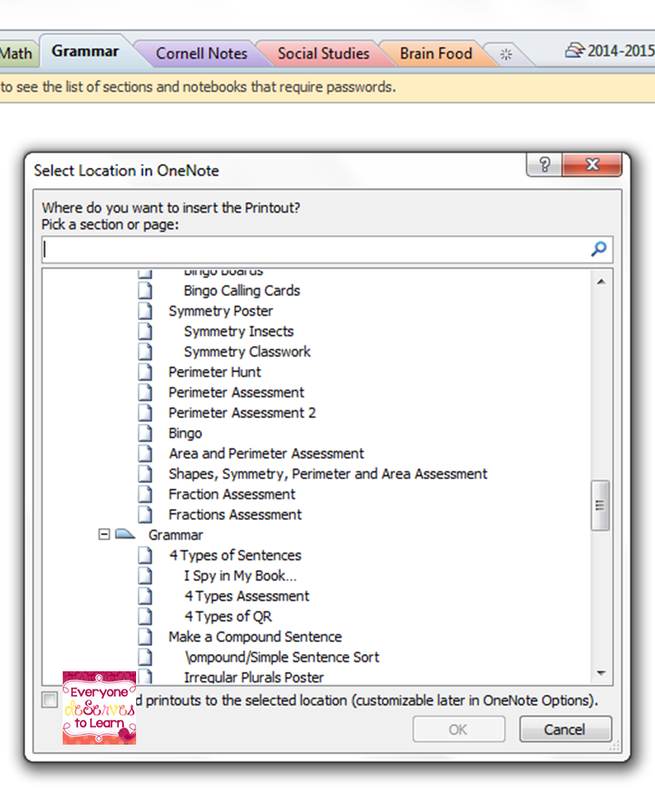 One Note is a Microsoft Office program which acts like a 3 ring binder. All the teachers in my school have used One Note for lesson plans and curriculum for about 3 years, and this year grades 3-8 were given access as well. 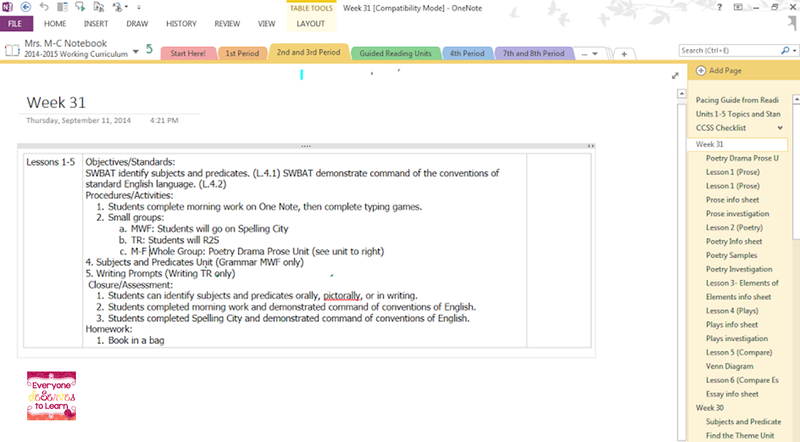 I'll start by showing you how I organize my lesson plans. Since I teach multiple grades, I create a simple table that I can forward to administration. The links lead to other pages within my Lesson Plan notebook. Once you click the link, you are taken to a specific plan. The scroll bar on the right (yellow) makes it easy for me to keep all the handouts and supplementary materials I need right next to the lesson plan. Once I've collected all the materials I'm going to use in a lesson, I decide which ones to place into the notebook I share with my students. Click on Insert, then file printout. 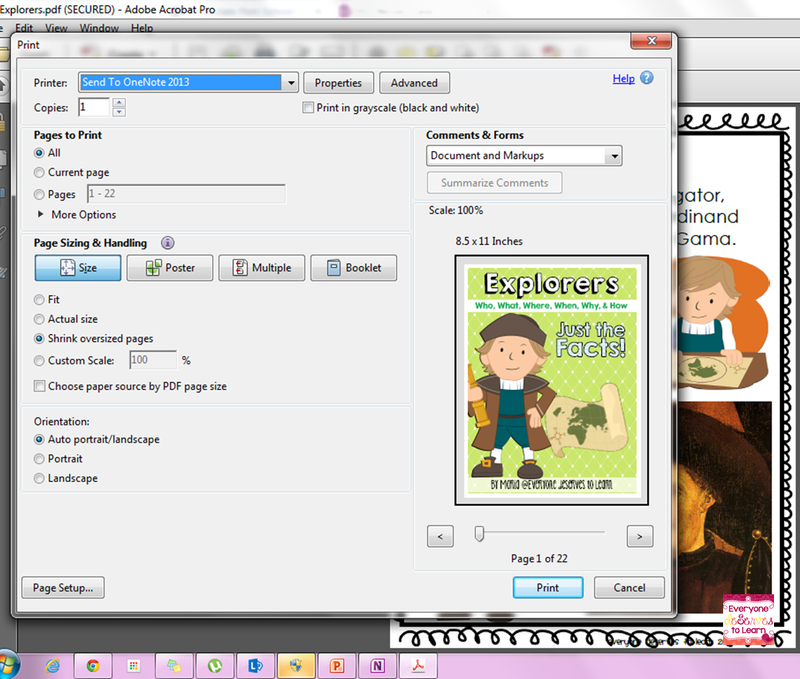 Then you can choose your file to print the same way you would choose an attachment for an email. In the print dialogue box, switch the printer to Print to One Note, then click print. A dialogue box will pop up in One Note asking you where you'd like to place the document. 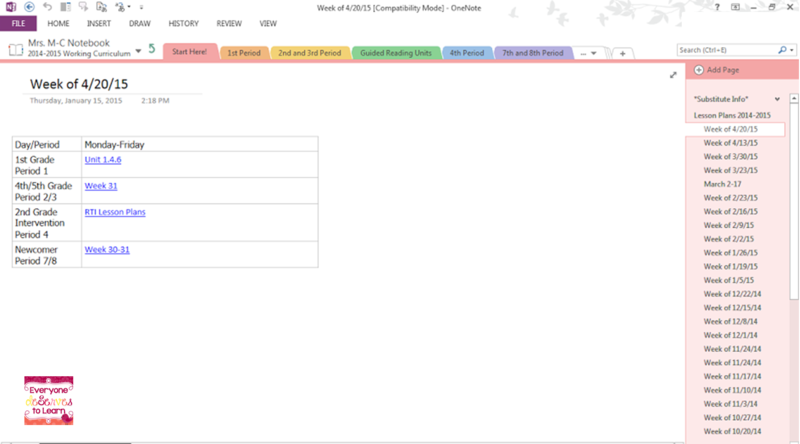 If you create a class notebook through Office 365, you have the option to create a "handouts" space and a "collaboration" space. Here's the difference: all students in that notebook can SEE and COPY from the "handouts" space, but can only edit in the collaboration space. My classes mostly use the "handouts" space, which I call Student Work. In Student Work, I have tabs for each subject I teach. Along the right side are all the materials I've placed in that tab. 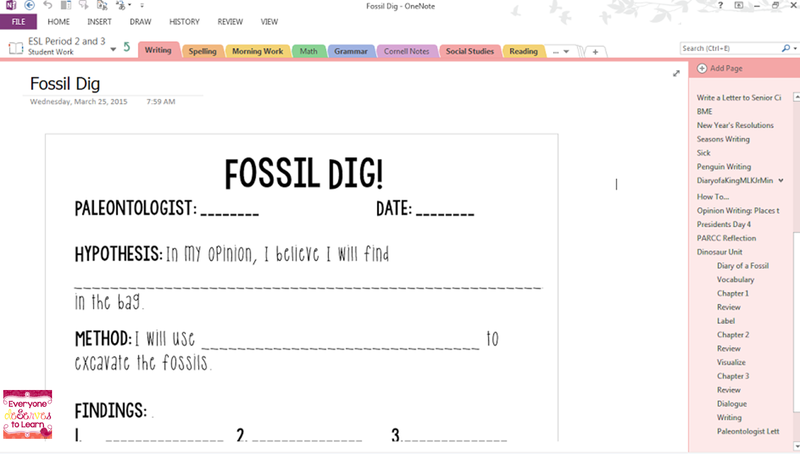 Once I copy and paste a worksheet into Student Work, I model for and tell my students which tab to go to. I'll say, "Go to Student Work, Reading." Once there, I show them the page they need to copy. I try to always make it the one on the bottom of the scroll bar to make it easy. 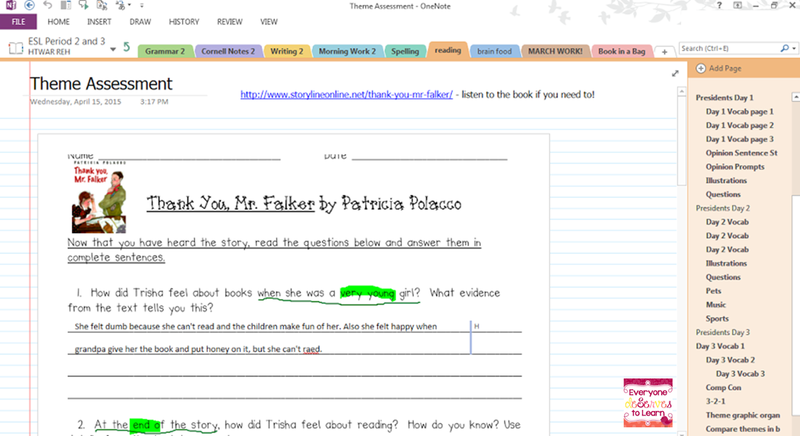 From there, students copy and paste the page into their own personal notebook, which only the student and I can see. 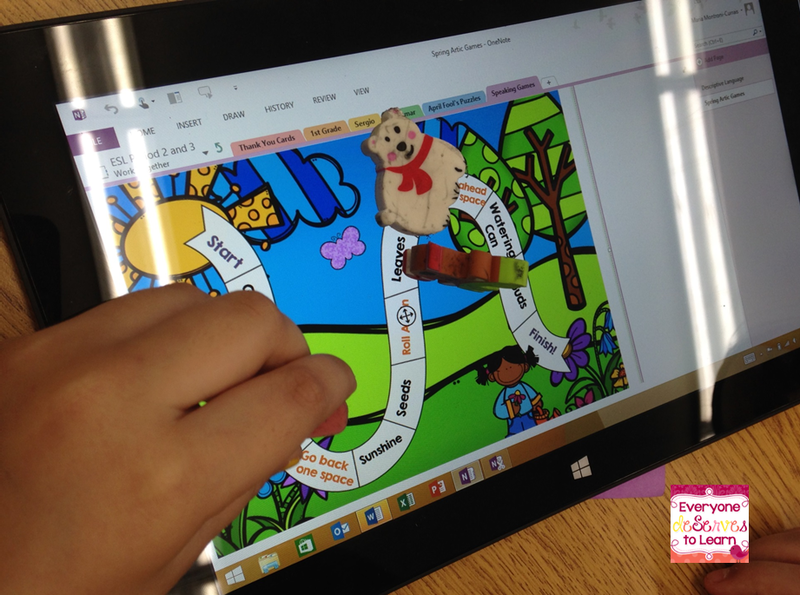 After copying the page into their notebook, students can use their finger, a stylus, or the keyboard to write and draw on their tablets. 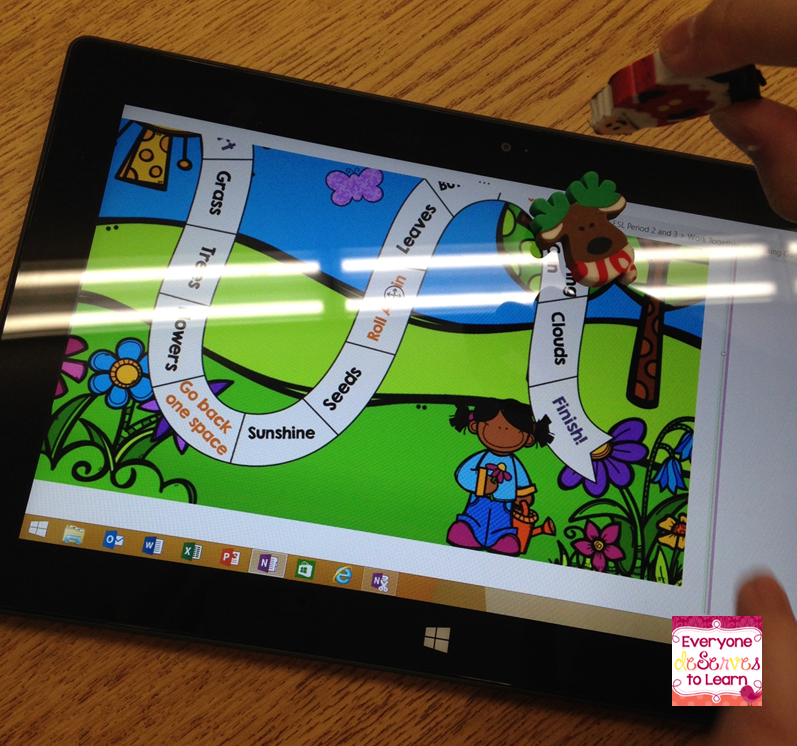 We have Dell Pro tablets, but we have also used Surface RT's. One Note is also accessible as an app for iPads. To grade work, I simply access each student's notebook and find the page I need, then mark up as necessary. This is quite tedious, as you have to go in and out of each notebook and find the tab and page you want. Some teachers have their students email the page they've worked on, but I haven't tried that yet. 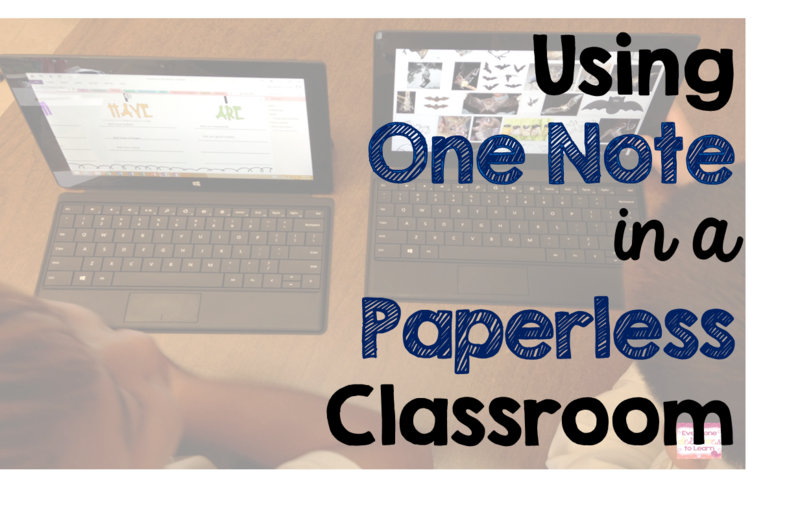 If you'd like to learn more about using One Note in the classroom, send me an email! I'm happy to answer any questions you have. Are you already using One Note? 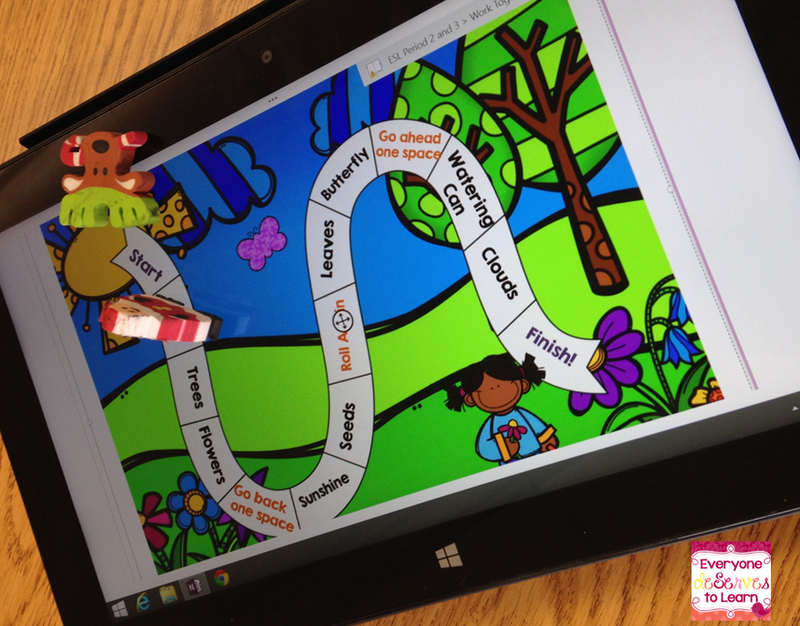 Let me know how you are using it in your own classroom! In my position as an ESL teacher, I wear several hats: counselor, coach, social worker, and speech therapist. I'm in no way certified in speech pathology (unless you count the one course I slept through took in linguistics) but we all know that when duty calls, teachers rise to the occasion. Several of my lower-proficient ELL's have been really struggling to produce basic sounds, let alone full on words or sentences. Some jumble through phrases, requiring multiple repetitions to be understood. Others get stuck in the middle of a sentence, not recalling what they've already said and therefore not knowing how to go on. There are plenty of reasons for all of these examples: lack of first language (L1) proficiency, bilingual transfer (when words are forgotten in one language as the other gets stronger), or a speech disability which prevents the child from producing sounds in any language. I decided to try to tackle these issues by mixing the bit I know about speech therapy with current trends in language acquisition theory. 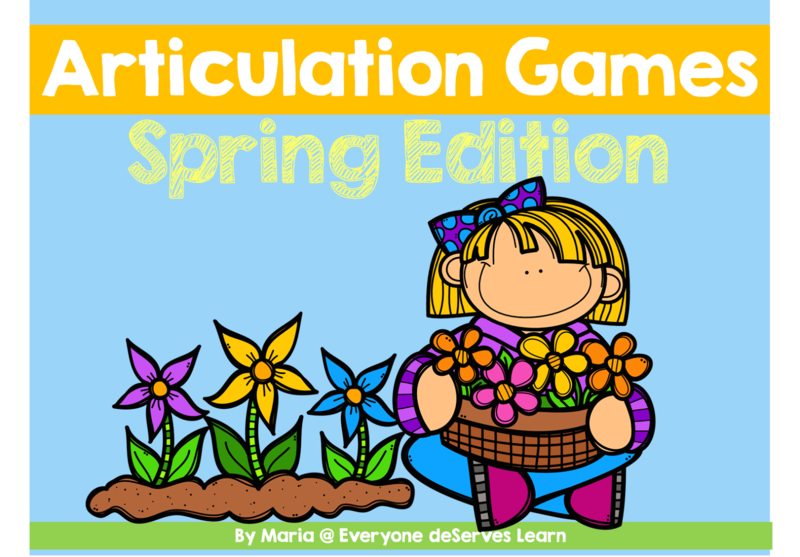 I play a lot of conversational speaking games in my classes on a regular basis, but realized that I need a more targeted and intense focus for some of my Level 1 and 2 speakers, thus, my Articulation Games were born! 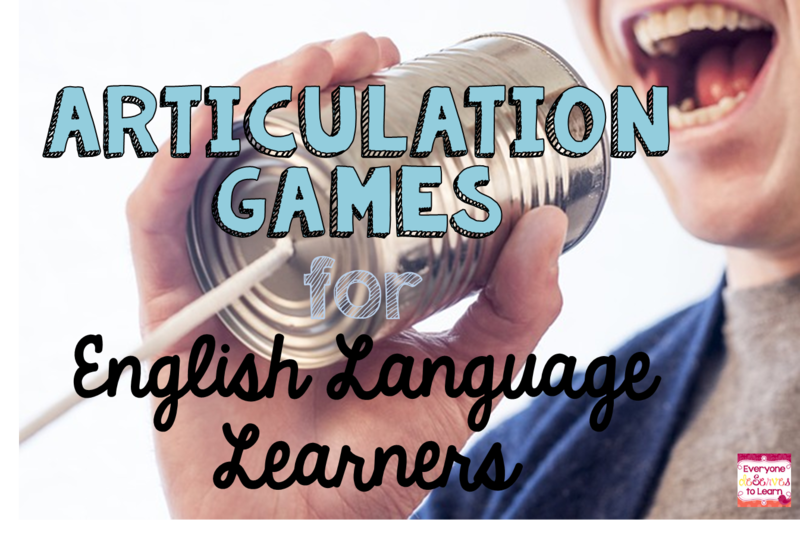 In these games, students can work on the goals and objectives that best suit their speaking needs. For my lowest proficient students, I had them say/repeat the word, then identify it in the picture. For my higher proficient students, I asked them to describe the word they landed on. I included challenge cards (not pictured) which are great open-ended and higher level thinking questions. Since my school is paperless, I simply printed the PDF into our file-sharing program called One Note, and my students were able to access it. For a whole-group game, I displayed the game board on my white board, and each student had a different colored magnet to use as a marker. Our articulations and descriptive sentences started out low and slow, but soon gained momentum after plenty of modeling from me. The current trends in ELL focus on learning language through the content area, and this is a great way to put that theory into practice. 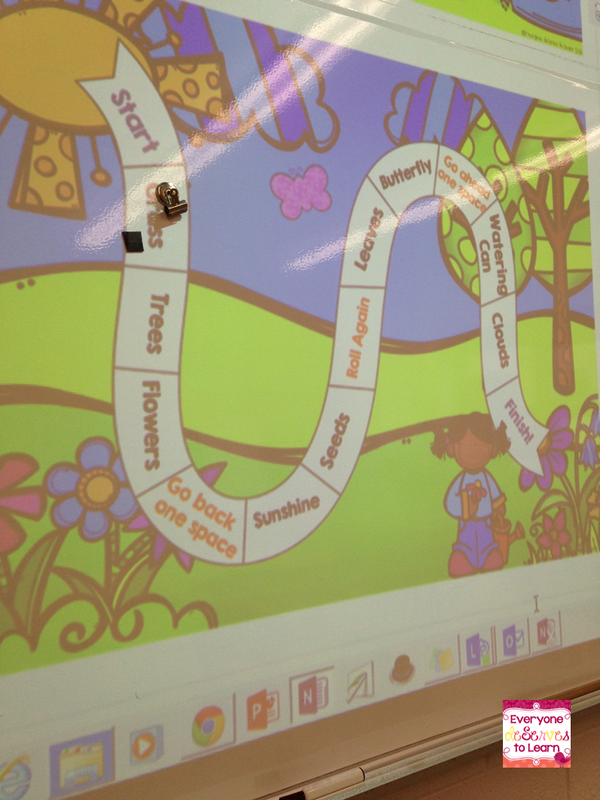 The language in these games all revolves around things we see in the spring, and touches on some science concepts. I was so pleased with the progress my students made in their speaking after just one class period! We went from "Grass green." to, "The grass is green. We walk on it." 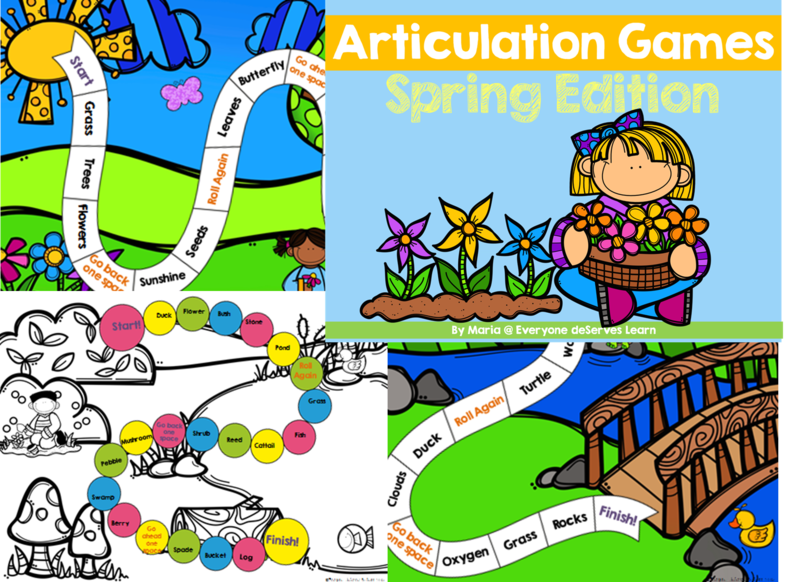 If you're interested in trying these games out with your own ELL's or speech therapy students, click on any picture to head to my TPT store! I'd love to give one away! Just leave me some love in the comments and I'll choose a winner on Thursday. Make sure to leave your email! Hooray for April! I'm starting off the month with Spring Break, so I know it will be a great month. Here's what's up for this month's currently. First of all, how cute are those chicks? I love the way they're all lined up. 1. I like to start off my morning with some "mood" music. Not that kind of mood! I choose my Pandora station based on what the day will bring. If we're doing presentations, I put on Broadway. If we're working on a project, I put on Top Hits so we can move and groove. If we're taking a test, I put on classical. Today is the last day before Spring Break, so I put on some good old Jimmy Buffett and the Beach Boys to get us in the mood for warmer weather. 2. Spring Break. Starts today. Hallelujah. 3. Next week I'll be taking the exam (kind of like a Praxis) to become a Principal. Next week I will also start studying. I have terrible-awful study skills and prefer to take tests cold. But this test cost $425 so you bet your bottom dollar that I will be studying. 4. I have plans here and there for Spring Break, but thankfully my week isn't too packed. I already have Sunday night blues and it hasn't even started yet! 5. I keep saying, "I'll just paint my own toes." Never happens. And really, they do such a much better job than I do! 6. 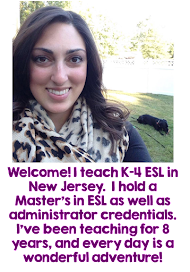 Although I currently teach ESL, I won't be a teacher forever, and I think my blog name will suit my career as an administrator as well. That's it for me! Link up with Fabulous Farley for your Currently!